Alam reached out to Absolutely wanting to give his girlfriend Taren a simple and romantic proposal. The catch? It had to happen in three days! Since Alam and Taren reside in Edmonton a coffee meeting was swapped for FaceTime. After Alam shared the details of his relationship with Taren, Absolutely was quick to dream up a couple ideas that were sure to blow away Taren. After choosing to go with the Evening Picnic, planning, booking, shopping and designing was quickly underway. The day began with a scenic day trip to Banff, AB. 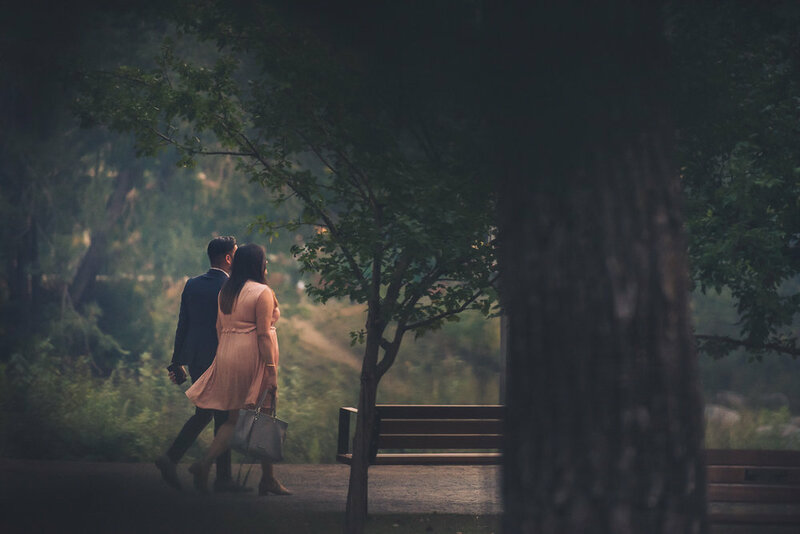 After a beautiful day in the mountains, Alam and Taren returned to the hotel to freshen up, got dressed and made their way to the River Cafe in Prince's Island Park. After a great dinner, Alam told Taren there was a movie in the park they should check out. As Alam and Taran made their way down the path, along the river, they came across a large rock with a letter addressed to Taren. Taren's letter read "Turn right and follow the light. Hint: look for letter #2." To Taren's right was a candle lit path leading to an evening picnic fully equipped with champagne, cupcakes, pillows, blankets, flowers and letter #2. As Taren approached the picnic and turned to grab letter #2, Alam quickly got down on one knee - ready to pop the big question. When Taren turned, the magic happened! After an "Absolutely,"
Taren read through her pre-written love letter from Alam and the couple spent their evening enjoying their newley engaged bliss. Absolutely has a 100% success rate, specializing in capturing the unique story of your relationship and turning it into an unforgettable and custom proposal. Copyright © Absolutely Proposals & Romantic Events 2017.